Considered one of the most beautiful theaters in Mexico, the Teatro Juárez was inaugurated in 1903 by General Porfirio Diaz. Its portico is in the Roman Doric style, and among its many charms is an art nouveau foyer. 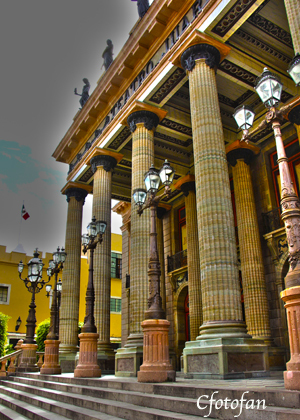 A magnificent theater in the heart of Guanajuato. Construction was begun in 1872, funded by General Florencio Antillón, who contracted the services of engineer José Noriega. After an interruption, General Manuel González became involved in the project, bringing onto the team the engineers Antonio Rivas and Alberto Malo. These two modified Noriega’s original plans, adding elements that would result in a theater even grander than originally planned. When General González passed away, Joaquín Obregón González funded the continued construction, which was finished in 1903. Access to the theater is by a series of wide steps framed by a cantera stone balustrade and flanked by two bronze lions and wrought iron lamps. The portico features Doric columns in green cantera stone with fluted shafts, and a capital of carved lyres; in the entablature, we see a section embellished with garlands and faces of angels. A balustrade and bronze sculptures of the Greek Muses standing atop pedestals crown the theater’s façade. Entering the theater, we see a foyer with smooth shaft columns and capitals carved with garlands. On the left, there is a fine wood bar-reception desk. The ticket desk is a similar piece, and is complemented by an antique clock. To the right there is a staircase with a banister, both worked in iron, with three flights of stairs and a top landing. Here, one finds an impressive oil painting of the coat of arms of Santa Fe de Guanajuato (the original name of the city), and two sculptures of muses in white marble upon pedestals. Bronze sculptures in round-arched recesses add to the charm of this space. The foyer leads into an area known as the smoking room which, like the staircase, features a caissoned ceiling, here with four pendant oil lamps in the shape of lyres. The walls are decorated with acanthus leaf carvings, and there are slender bronze bases quite like small estípite pilasters atop which are sculptures of Dante, Camoëns, Mozart and Gretoy, among others. There is also a very large mirror with a gilded vegetation motif frame. The theater’s steel roof features intricate coffer work on the interior. Lighting is by lyre-shaped iron lamps. Over the great arch of the stage curtain is a panorama of the Eastern city of Constantinople. There are five seating levels, each with iron banisters. The furniture in the foyer is upholstered in red with gold trim. A la muerte del general González, el licenciado Joaquín Obregón González patrocinó la continuación de la construcción, concluyéndose en 1903. El acceso es por medio de una escalinata que tiene balaustrada en cantera con esculturas de leones en bronce y faroles de hierro. Pórtico con columnas dóricas en cantera verde de fuste estriado y capitel decorado con liras; en el entablamento, franja decorada con guirnaldas y caras de ángeles. El remate nos muestra balaustrada y esculturas en bronce de las musas griegas sobre pedestal. This entry was posted in captures, culture, fotografías, fotos, gallery, historia, history, Images, imágenes, photos, pictures, travel and tourism, turismo and tagged Guanajuato, Juarez Theater, México, Teatro Juárez. Bookmark the permalink.